SIDES from the top four beat sides in the bottom four in Division One of the Halifax League yesterday. Illingworth retained their 14 point lead thanks to more excellent contributions from two of their best players this season, Daniel Murfet and Jamie Moorhouse, in a 77 run home win over Blackley. Aussie Murfet made it 782 runs from 12 innings with 74 as Illingworth made 240-9. James Lawton’s 46 was the next-best contribution. Moorhouse then took 7-57 to dismiss Blackley for 163. Seven visiting batsmen reached double figures but Bilal Sheraz’s 31 not out was their top score. Moorhouse has 32 league wickets but is still playing catch-up with Bradshaw’s Aaron Buckley. Buckley moved on to 38 with 5-44 at Clayton but his side let a good position slip and lost by 18 runs. Clayton were 10-3 and 43-5 before Jason Gelder (81) stalled the visitors’ progress and John Jonas and Mitesh Mistry chipped in with 32 apiece down the order. Chasing Clayton’s 209, Bradshaw slipped from 104-3 to 123-8. James Thompson (40) and Buckley (27) made a bold bid to rectify the situation but Mistry (5-65) and Matthew Roe (4-31) helped the hosts come out on top. Second-placed Clayton have a two-point advantage over Great Horton Park Chapel, who are in turn two ahead of Sowerby Bridge in what could develop into a three-cornered scrap for the second promotion place. Great Horton didn’t have things all their own way against lowly Stones, who battled to 142-9. Great Horton lost seven wickets in their victory push, Chris Brown top scoring with 38. 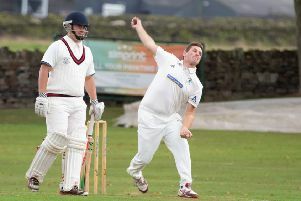 Sowerby Bridge won by six wickets up at Queensbury, making light of overhauling their hosts’ 263 to win by six wickets. Ollie Challis (81) scored well again for Queensbury while Jake Dixon took 6-103 for Bridge. Scores: *Clayton 209-10 (Gelder 81, Buckley 5-44), Bradshaw 191-10 (Collins 46, Thompson 40, Roe 4-31, Mistry 5-65) pts 12-6. Stones 142-9, Great Horton 143-7, pts 4-10. *Illingworth St Mary’s 240-9 (Murfett 74, Lawton 46, Moorhouse 7-57), Blackley 163-10 (Moorhouse 7-57) pts 12-4. *Queensbury 263-10 (Clough 40, Challis 84, Dixon 6-103), Sowerby Bridge 267-4, pts 4-12. Points (after 13): Illingworth SM 132, Clayton 118, Great Horton PC 116, Sowerby Bridge 114, Bradshaw 96, Blackley 68, Queensbury 50, Stones 42. THE top two in Division Two, Mount and Luddenden Foot, were both beaten and surprise packet Old Town moved into one of the promotion berths. Mount made 250 at Outlane thanks to Mahmad Gheewala (76), Anees Rawat (65) and Imran Ravat (47 no). However, they paid the price for leaving more than four overs unused, Mosan Raza’s 5-56 wrapping up their innings early. Outlane cruised to their target, second wicket pair Lee Mellor (111 no) and Chris Brook (69) helping the Old Lindley Road club to an eight-wicket win. Luddenden Foot were bowled out for 59 in reply to the 146 by Upper Hopton, who joined them in joint third place. Steve Adams was the Mirfield club’s star man, top scoring with 40 and following up with 6-26 as Foot were bowled out in 13.4 overs with Lee Broadbent (20) and Tom Hosker (13) their only two players in double figures. Old Town made it 70 points out of a possible last 72 with a six-wicket home win over Leymoor. A good all-round bowling effort left Leymoor 136-9 before Richard Jones (43) lifted the Leymoor total to 200. Home No 3 Adil Shan hit 69 not out and received strong backing as Old Town eased into second spot, seven points behind Mount who they have still to visit twice. Paul Quarmby’s 68 was in vain for Greetland at home to Bradley and Colnebridge. Ishtiaq Hussain’s 6-39 limited Greetland to 165 and the visitors moved fairly smoothly to a five-wicket success. Cullingworth were back in action, after failing to raise a team to go to Old Town the previous week, on a trip to Low Moor. The strugglers were bowled out for 86 with Steve Welch (39) and Jacob Crossland (21) among only four visiting players to trouble the scorers. Matthew Haley took 4-9 for Low Moor and James Overend’s 33 not out helped complete a seven-wicket win for the home side. Scores: *Greetland 165-10 (Quarmby 68, Ishtiaq Hussain 6-39), Bradley & Colnebridge 166-5 (Debenham 40) pts 3-12. Cullingworth 86-10 (Haley 4-9), *Low Moor HT 90-3 pts 0-12. Leymoor 200-10 (Allison 50, Jones 43) *Old Town 204-4 (A Shah 69) pts 4-12. Mount 250-10 (Gheelewa 76, Rawat 65, Ravat 47, Raza 5-56) *Outlane 252-2 (Mellor 111*, Brook 69) pts 3-12. *Upper Hopton 146-10 (Adams 40), Luddenden Foot 59-10 (Adams 6-26) pts 12-3. Points (after 13): Mount 118, Old Town 111, Upper Hopton 109, Luddenden Foot 109, Bradley & Colnebridge 92, Leymoor 88, Outlane 83, Low Moor 81, Greetland 46, Cullingworth 34.